Got some color on it. I also got this Engel 35 qt. fridge awhile ago and just haven't shared it. Man I still really dig your paint job. When are you going to put some sliders on that thing? Any updates? I just read this whole thread.....ok I skimmed it heavily. What trans are you running? What year? Also, what did your engine come out of? You said it was a half-cut, I'm going to need an oil pan or mod my front sump 1KD to clear the SFA. - no updates. I am held up trying to get some balance shaft bearings cause my idiot machinist tossed them and my other idiot machinist can't be bothered to help. - trans is a R-151f from a 86-87 turbo truck with the factory diesel bellhousing. - shouldn't need to mod the oil pan unless you decide to run high-steer. If you do run high-steer you will need to notch it. Sump doesn't need any modifying though. ^^^ thanks for the information so quickly. I have Hi-Steer on my 4Wheel Underground setup, so yea I need to mod the pan/sump. +4" of uptravel in the front runs out of room real quick! Might have to hit up gumtree or a wrecker for a used sump and pan. I have a 2006 R151f and am trying to figure out if the tail housings will swap from the R150(pre-95) to save myself a few bucks on buying another adapter( v6 to gear-drive t-case). I know you have a bunch of work and time in KZ lump, but there is a guy on ih8mud that put together a hybrid Kz/KD engine, since the blocks are the same. Yeah I made my own motor mounts. My 4Runner originally had a 22R-e.
Did you use DIY mounts or did you graph some toyota mounts onto the frame? How is the rattle/vibe in the cab? I used 22r mounts. They made it pretty reasonable in the cab. I started with some Polly motor mounts. First time I fired it up with those I thought it was going to shake itself apart. Needless to say they were quickly replaced. Good stuff man! Thanks to the help. This week I was in Las Vegas for work and I met up with "LJ-70". 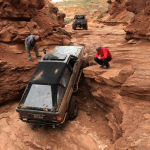 Him and his wife picked me up from work in the 70 series Land cruiser and treated me to a trip into the mountains to go cruise around the trails above Las Vegas. He just finished the motor swap from a 2L-t to a 2L-tII. He even let me drive for awhile. Thanks for the hospitality!! It was great to meet you. Manchester via London Heathrow, England. Cool! 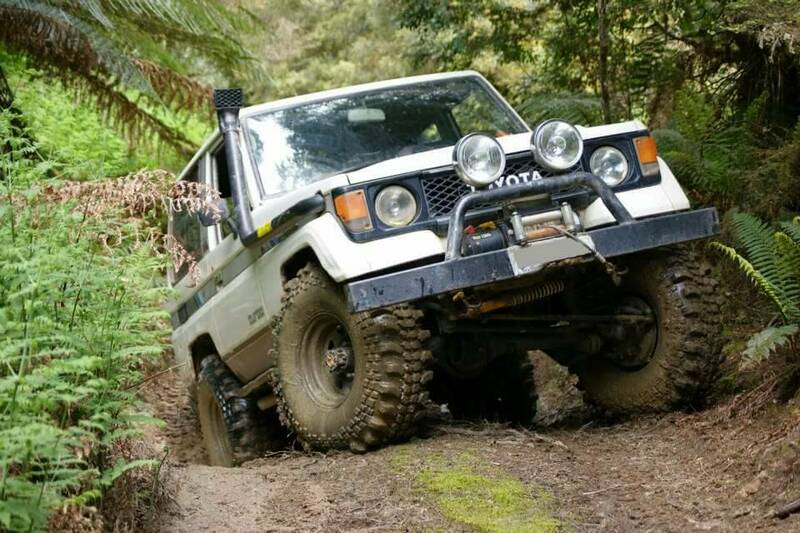 I used to wheel with a mate that had a LJ70 Bundera. It was a beast! Shared a lot of parts with a HiLux. How many would there be in the States? How many would there be in States? Probably less than 100. They have to be 25 years old before they can be imported and licensed. That is a terrible rule, those land cruisers are awesome! Have you made any progress on the 4runner? ^^^ Truth... you can thank the wonderful EPA and NHSTA for that. Have you made any progress on the 4runner? A little progress. My Dad just bought a new lathe and wanted a little project to play with so I ordered a bronze bearing blank for him to turn into balance shaft bearings. He has already made some test sample and installation tools that I have test fit. Once he finishes them I can start to finally reassemble the deisel. Good to hear thing are starting to move again. My rebuild took a lot longer than expected as well. What did you end up making them out od? Aluminum bronze bearing stock from McMaster-Carr. Started to install the pistons today and got them all in with plenty of assembly lube on everything. You can see in this picture of the old cylinder head that ther is no recess in the combustion chamber of the head. So essentially you are right that the valve depressions in the pistons are the only areas where the fuel can remain. That is how they achieve a 21.2:1 compression ratio. Calling All Poly Goat Alumni!!! Page created in 0.349 seconds with 47 queries.